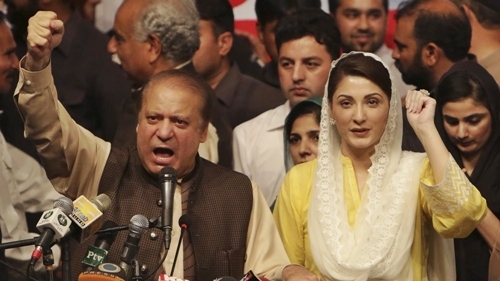 A Pakistani anti-corruption court has found former Prime Minister, Nawaz Sharif guilty of corruption and sentenced him to 10 years in prison and a $10.5m fine, a move that could be a blow to his PML-N party’s chances in an upcoming general election. His beautiful daughter will also spend 7 years in prison. According to Al Jazeera, Judge Muhammad Bashir read the verdict before a packed courtroom in the capital Islamabad on Friday. In 2016, an International Consortium of Investigative Journalists (ICIJ) leak of 11.5 million legal documents, dubbed the 'Panama Papers', showed the Sharif family had secured a $13.8m loan in 2007, using the apartments as collateral. "Today, the anti-corruption court’s verdict has made it clear that these assets, the Avenfield apartments, were acquired through corrupt means,"prosecutor, Sardar Muzaffar Abbasi told reporters outside the courtroom. Maryam was also found guilty, and sentenced to seven years imprisonment and a $2.6m fine. With this verdict, Maryam Nawaz now stands disqualified from standing in Pakistan's July general election as a candidate. Her husband, Muhammad Safdar was also sentenced to one year in prison, and will stand disqualified from contesting in the upcoming polls. In a tweet after the verdict, Maryam Nawaz said people stood by her father. "Well done Nawaz Sharif! You weren't afraid, and you didn't bow down. You gave priority to Pakistan over your own personal interests. The people stand by with you. You will be victorious." "I am absolutely ready [to go to jail]," Maryam told reporters earlier this week. "This is not something to be afraid of."